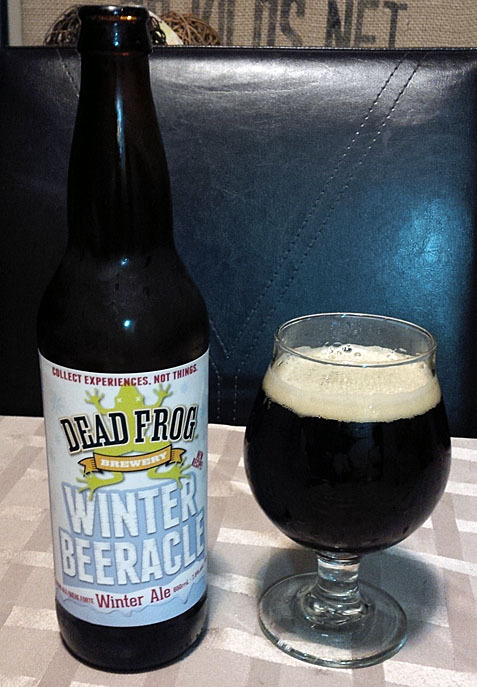 Dead Frog Brewery – Winter Beeracle: I was craving this one again and I managed to find only one of them a couple weeks ago, so rather inspired by the crappy weather on the weekend it felt wintery enough to down a winter beer that was brewed in Aldergrove, BC and was enjoyed at home in a snifter like glass. Aroma and Appearance: Pours a very dark mahogany that appears brown in the glass, but reddish when you raise it towards the light with a bit of foam and teeny little bubbles near the surface of the foam. The aroma is toffee, raisin, molasses and dark fruits. Flavour: Bready malt with orange, spice, sweet molasses, toffee, cherries and a dark chocolate mildly dry bitter finish. Overall Impression: Well I was craving another and this delivered, I loved this years version of this beer and it seemed to hold up nicely 6-8 months after bottling. Rating: I give it a 8/10 as in excellent, anytime I crave another one of these I have to rate it pretty high. I think a bit aged helped balance it out even more as no one flavour took over the beer. Food Pairing: A nice winter spice cake would work well. I thought most of the local winter release were all pretty great, what was your favourite local winter ale?